Even Under Threat, Syrian Artists Paint In Protest In Syria, anyone who speaks out against the regime of President Bashar Assad risks harassment, detention or worse. A gallery in Beirut recently featured artwork smuggled out of the country — much of it inspired by the Arab uprisings. 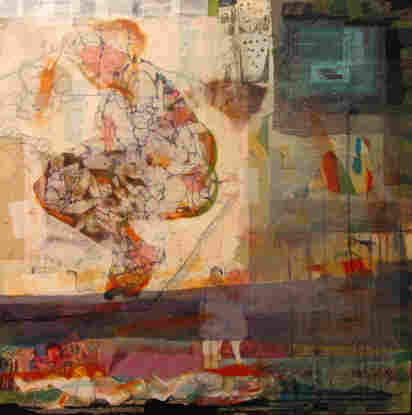 Tarek Butayhi's 2011 mixed media on canvas work, Untitled. Butayhi's work was displayed in the Artists From Syria Today exhibition at the Espace Kettaneh Kunigk gallery in Beirut. In Syria, anyone who speaks out against the regime of President Bashar Assad risks harassment, detention and sometimes worse. One famous cartoonist who'd lampooned Assad was pulled out of his car last summer by pro-regime thugs and had his hands broken. Public figures like singers and actors are under much pressure to keep silent. Even a small and critically acclaimed group of Syrian painters is not immune — but that might be attracting buyers outside Syria to their work. When the Syrian uprising began last spring, artist Hiba Akkad stopped painting. She was appalled by the fact that Syrian troops were shooting protesters in the streets. "I didn't want to paint anymore," she says. "I cared about what was happening around me, so I went to be with the people. Whatever the people were doing, I wanted to be with them." Akkad started protesting in her neighborhood in Syria's capital, Damascus. Men would hoist her on their shoulders as she shouted anti-government slogans — this in a conservative neighborhood that had at one time shunned her for deciding not to wear a hijab. The protests lasted for months. Then came the intimidation: "It was a lot of pressure. It was difficult to go out to protests," she recalls. Syria's dreaded security forces started asking about her in the neighborhood. At one point, pro-government thugs tried to break into her house and chased her down the street. She stopped protesting and spent more time at home. "This was when I started to miss painting," she says. "But I had doubts if I was still able to paint after all those months." A gallery in Beirut recently showed paintings by Akkad and other Syrian artists. Director Marc Mouarkech says Akkad's work was among his favorites. "I cared about what was happening around me, so I went to be with the people," says Syrian artist Hiba Akkad. "Whatever the people were doing, I wanted to be with them." 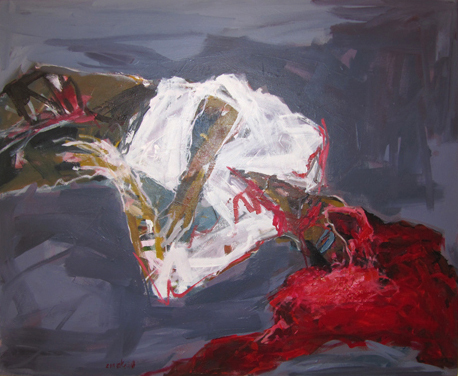 Above, Akkad's 2012 mixed media on canvas work, Untitled. "She likes to use rags, drawings and papers and she mixes everything," he says, as he points to one of her colorful, mixed-media canvases. "She tried to create here scenery where a girl is really afraid from what is happening around her. You can see people are getting killed, but it is colorful. She [will] always try to use colorful stuff just to add this kind of hope to her painting." Mouarkech says these artists are basically forbidden from showing such work back in Syria. Most exhibits in Syria nowadays are pro-government. No one is buying work, and small galleries are closing. So this gallery took a risk and told the artists they could show their work in Beirut, just an hour's drive from the Syrian border. "The artwork was brought here in three different parts and they were, let's just say, smuggled," he says. "So basically they arrived here just three days before the opening on a low profile." Mouarkech says he had no idea what would be in the boxes. Once he opened them, he found not only Akkad's work but also paintings, photography and sculpture from 15 other Syrian artists. After a few weeks in the gallery, nearly all of the work had sold. Critics and artists agree that Syrian art is some of the strongest is the region. But interest in Syrian art is also inspired by news of a protest movement that appears to be turning into an armed conflict. Another gallery in Beirut is also showing Syrian paintings. The work here depicts crowds of faces that look like mass protests, portraits of warriors, and men who appear to have their hands tied behind their backs. Attorney Faris Abi Younes is about to buy one of these Syrian paintings. He says he only recently got into collecting art — that he responds most strongly to work about the Arab uprisings. "You have the feeling that it expresses something really factual, really related to our reality," he says. For Akkad, it was all about living that reality before she could paint it. "My painting before the revolution was very individual," she says. "I would only care about personal things. Now, I care about what is happening in the country and my experience in the revolution. If I hadn't lived this experience with people on the street, I wouldn't be able to paint." Akkad now lives in exile. She says Syrians who're still inside the country — and still protesting — have it way worse than she does. All she wants, she says, is to go back to a country where the violence has ended and she can make art again.